The Sustainable Agriculture Coalition has a new website and blog. One recent post covers the Presidential Transition Team Project, for which (Friedman School alum) Aimee Witteman is the contact person. The Community Food Security Coalition's recent electronic newsletter announces the group's fall 2008 election results. The returning board members include the Congressional Hunger Center's Ed Cooney (a Friedman School overseer) and the coalition's president Molly Anderson (adjunct faculty and founder of the Agriculture, Food, and Environment program at the Friedman School), and new members include Laura Irizarry (another alum). As you probably know, the coalition's vibrant listserv is a leading source of information in community food security. In May, we linked to the Miami Herald's coverage of the struggle between Florida tomato pickers, Burger King, and a dirty tricks company hired by the fast food giant. Earlier this month, the Green Fork's Leslie Hatfield provided an update on recent developments in an article and accompanying video for the Huffington Post. For Burger King, the Goldman Sachs-owned chain that signed with CIW [the Coalition of Immokalee Workers] last May at the US capitol building (but only after months of protests, a blog scandal and allegedly spying on CIW's partner group, the Student/Farmworker Alliance) the penny-a-pound increase amounts to an estimated $250,000 dollars per year. To put that in perspective, Eric Schlosser's November 07 op-ed "Penny Foolish" pointed out that "[i]n 2006, the bonuses of the top 12 Goldman Sachs executives exceeded $200 million - more than twice as much money as all of the roughly 10,000 tomato pickers in southern Florida earned that year." More recently, organic grocery chain Whole Foods came to an agreement with CIW. That Whole Foods was beat to the table by such cheap, decidedly un-organic eateries as Taco Bell, McDonalds and Burger King may seem ironic to those who snidely call the chain "Whole Paycheck" and may expect that those relatively high prices might translate not only to the food being organic, but also fair. This is, in part, why we're seeing from food advocates a shift away from "organic," a label that has not only been co-opted by huge corporations, but also speaks only to a food's impact on personal health (and to a much lesser extent, ecological health, but only in its initial production and not, say, its shipping) toward the more inclusive term, "sustainable," which is also being co-opted by industry but at least, in theory, speaks to other aspects of food production, including labor. Now, CIW is after Chipotle, the growing chain that has built a reputation for social responsibility in the organic and local food arenas, and whose "Food with Integrity" campaign stands to take a major hit in the credibility department if they don't sit down with the Coalition. But that could prove difficult for Chipotle, which released a statement last month (before things got really crazy, even) warning share holders that the weak economy, coupled with rising food costs, would likely amount to lower profits than last year's. No one knows what the future holds, but as our economic system hovers over the proverbial "rock bottom," it seems like a good time to revisit our policies, both national and personal, when it comes to the money we spend. What is the value of a tomato, and why? What (from fertilizers and pesticides to labor to transport) went into it, and does its price reflect those inputs? Or has a market driven by speculation and subsidies installed a false cap on that price, creating a decidedly unsustainable system that benefits CEOs over citizens, puts the squeeze on smaller businesses and leaves the laborers to pick up the slack? The lead article in the most recent Foodlinks America newsletter says that food assistance benefits might be included in a new round of economic stimulus. Congressional leaders are contemplating a new and bigger stimulus package to help pull the U.S. out of its economic doldrums. Regardless of the Presidential vote outcome, Democrats in the House and Senate are expected to return to Washington, D.C. for a post-election, lame-duck session to try to jump-start the sagging economy. The new economic stimulus plan will likely contain provisions to directly aid low-income Americans. “We have to prop up consumption,” said Representative Barney Frank (D-MA), chair of the House Financial Services Committee. Two likely elements of any bill would be an extension of unemployment insurance benefits and a temporary increase in Supplemental Nutrition Assistance Program (SNAP) or food stamp benefits. Both actions would channel money to people who would probably spend the money in the slumping retail sector, spend it all, and do so almost immediately. The $107 billion stimulus measure passed in February 2008 provided tax rebates to most households but did little to influence the economy. The House passed a $60 billion stimulus bill in September that would have boosted SNAP benefits to 105 percent of the Thrifty Food Plan, but it failed in the Senate. A companion Senate measure was proposed that increased SNAP/food stamp benefits 10 percent, added $450 million for the WIC Program, $50 million for The Emergency Food Assistance Program (TEFAP), $30 million for the Commodity Supplemental Food Program (CSFP), and $60 million for elderly nutrition, but it was never brought up for a vote. A new package “may have to be larger … in light of the events that have transpired since we had our legislative action on the floor,” stated House Speaker Nancy Pelosi (D-CA). Consequently, lawmakers are beginning to discuss a $300 billion deal to help forestall any further economic collapse. Presidential candidate Barrack Obama has been huddling with congressional Democrats fashioning the plan. “We should extend expiring unemployment benefits to those Americans who’ve lost their jobs and can’t find new ones,” he said. Obama’s policy staff also backs money for road and bridge construction as a relatively easy way to create jobs, address infrastructure needs, and pump funds into the economy. The Republican candidate, Senator John McCain, though not completely rejecting Democratic proposals, prefers making expiring tax cuts permanent and lowering corporate taxes instead. Although President Bush had previously threatened to veto any new stimulus bill, Administration opposition is softening as the economy continues to sour. Federal Reserve chairman Ben Bernanke agreed on October 20, 2008 that, “consideration of a ‘well-targeted’ fiscal package by the Congress at this juncture seems appropriate." Other articles in the newsletter from TEFAP Alliance cover the new WIC vouchers, school food priorities, and farm-to-school programs. Some pretty good writers are trying their best to explain the new revenue-based ACRE farm program option in the 2008 Farm Bill. But it's not working. This material just does not seem to cross the barrier between the outside air and the interior of my skull. I feel like one of the king's subjects in the children's fable about the king's new suit, which is supposedly invisible to foolish people. People refuse to admit that the king looks naked, for fear that others will think them a fool. I wonder if the same thing is happening with the ACRE program. Will people think me foolish, if I just admit that I cannot understand this program? The direct payment program pays farmers a fixed dollar amount per historical base acre. This dollar amount does not change with market prices or with production on the farm. Like direct payments, counter–cyclical payments are based on historical production. In contrast, marketing loan payments are based on current production. Both the counter–cyclical and marketing loan programs are price–based programs. Congress specifies the marketing loan rates and counter–cyclical target prices in the Farm Bill. These fixed support rates essentially establish a floor or lower bound on the per unit value of the crop, as payments are triggered when market price drops below them. The creation of a floor reflects the policy objective of traditional price support programs, which is to assist farmers with managing the systemic risk of chronically low market prices that extend over a long period of years. A systemic risk is a risk beyond the control of an individual producer. The combination of direct payment, counter–cyclical, and marketing loan programs will be referred to in this article by the acronym DCP+ML. A state revenue payment is triggered for a given crop and year when actual state revenue (state yield per planted acre times U.S. crop year price) is less than the state’s ACRE revenue guarantee. This difference is the state’s ACRE payment rate. For any crop in any year, the payment rate cannot exceed 25% of the crop’s state revenue guarantee. ACRE’s state revenue guarantee cannot increase or decrease more than 10% from the prior year’s guarantee. Over time, the guarantee will follow prices and yields up and down. Thus, ACRE’s revenue guarantee is not a floor, implying that ACRE will not provide protection against chronically low prices. Receipt of an ACRE payment also requires that a farm’s revenue for the crop and year be less than its benchmark revenue for the crop. The latter equals (1) the product of the farm’s 5–year Olympic average yield per planted acre times the 2–year U.S. average price, plus (2) the farm’s insurance premium if the farmer bought insurance for the crop. The ACRE revenue protection payment is made on acres planted to eligible crops, but total planted acres covered by ACRE are capped at the farm’s total base acres. Total payment a farm receives from ACRE is the sum of (1) 80% of the farm’s current direct payment, (2) ACRE revenue protection payments, and (3) marketing loan payments at a 30% lower loan rate. This discussion focuses on ACRE’s basic features. Additional details on ACRE are contained in the appendix. Hmm, that's clear as ... mud. But perhaps it is just me. Choices, incidentally, is the agricultural economics profession's outreach publication for lay people. We write even more densely for each other. Both the ACRE program guarantee, and the ACRE farm revenue benchmark are calculated from history. That is, state shortfalls and farmer shortfalls are judged in relation to what revenue could reasonably be expected to be. To calculate what the state and the farmer should expect in terms of revenue, we need a measure of historic yields and historic prices. That, in turn, will give us a per acre revenue number that we can compare to the revenue the state and the farmer actually generated per acre. In order to get the yield, the statute says we look at the past five years' production average, calculated without the highest and lowest values. We do this for the state in calculating the "ACRE program guarantee" under § 1105(d) and we do it for the individual in calculating the "ACRE farm revenue benchmark" under § 1105(f). Then we find price by looking at the average market price for the preceding two years under § 1105(d)(3), which is incorporated to the farmer's benchmark calculation under § 1105(f)(1)(B). The average market price is determined by looking at the average price received for a given commodity on a national basis during the 12 months occurring after harvest—the marketing year. Well, Schutz does also say, "I find this statutory text difficult to parse and would welcome a discussion with anyone who cares to parse it with me. " If you'd like to "parse it" with Schutz, as he says, you can find the text of the law here (.pdf). Have fun. The ACRE program is voluntary, and participation requires farmers to give up a portion of their reliable direct payments. Given the complexity, and the scattered references throughout these explanations to reduced revenue under certain price and production conditions, I am willing to guess that few farmers will adopt the ACRE program. Like the swindlers who convinced the king they had provided a fine royal suit, because nobody would admit they couldn't see it, perhaps the main contribution of the ACRE program was to provide the illusion of reform and policy development in a Farm Bill that really had little of it. A student recently pointed out this 2007 document (.pdf) from USDA's Food and Nutrition Service (FNS), arguing that the Food Stamp Program -- now called the Supplemental Nutrition Assistance Program (SNAP) -- should not have further restrictions on eligible foods. [Update 10/23/08 4:30 p.m.: sentence corrected to clarify the date of the document]. I really do not know whether the list of eligible foods should be narrowed, but I had some questions about the reasons given in the document. Here is the agency's list of reasons, along with my own observations and questions. To make the discussion concrete, let us ask how well these arguments serve to justify including caloric soda and candy with food stamp eligible foods. 1. No clear standards exist to define foods as good or bad, or healthy or not healthy. This is a traditional food industry slogan, used when it helps to put off criticism, but entirely ignored whenever it suits a marketing message. What the industry hopes is that nobody will ever call a food "bad" or "not healthy," but that consumers will believe the industry's exaggerated health claims for fad foods. That history does not implicate FNS, of course, but it takes the shine off the argument. Would it really be so difficult to justify defining eligible foods in a way that left out caloric soda and candy? 2. Food restrictions would pose major implementation challenges and increase program complexity and costs. Currently, there is a code in the retailer's inventory system identifying whether a product is eligible or ineligible for food stamps. Checkout staff must already be trained in subtle distinctions. For example, rotisserie chicken served hot is ineligible, but dressed and ready-to-cook chicken is eligible. In what sense would administration be more difficult if caloric soda and candy were ineligible? 3. Restrictions may not change the nature of participants’ food purchases. 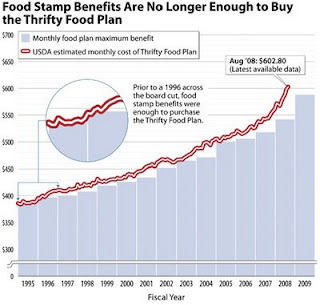 The FNS document discusses the fact that many participants are unconstrained or "inframarginal," because they contribute some of their own income to their food budgets, and hence can use food stamp benefits to free up cash resources to spend as they wish. It would be ineffective in some cases to prohibit soda and candy. But, by this argument, aren't the current restrictions that food stamps must be used only for food already equally ineffective for such consumers? 4. No evidence exists which indicates that food stamp benefits directly contribute to poor food choices and negative dietary outcomes, such as obesity. FNS writes, "While poverty is associated with obesity in some population groups and Food Stamp Program participation is closely linked with poverty, the independent effect of program participation on obesity is unknown." What priority does FNS give research with strong methodology on this question? There are additional good reasons for not restricting food stamps to just healthy food. Advocates for low-income Americans are highly worried that additional restrictions would discourage participation by eligible families. Discussion is welcome! Adam Voiland offers the list in U.S. News and World Report, along with a wealth of links to the supporting evidence, based in large part on a recent perspective article by Marion Nestle and David Ludwig in the Journal of the American Medical Association (JAMA). 1. Junk food makers spend billions advertising unhealthy foods to kids. 2. The studies that food producers support tend to minimize health concerns associated with their products. 3. Junk food makers donate large sums of money to professional nutrition associations. 4. More processing means more profits, but typically makes the food less healthy. 5. Less-processed foods are generally more satiating than their highly processed counterparts. 6. Many supposedly healthy replacement foods are hardly healthier than the foods they replace. 7. A health claim on the label doesn't necessarily make a food healthy. 8. Food industry pressure has made nutritional guidelines confusing. 9. The food industry funds front groups that fight antiobesity public health initiatives. 10. The food industry works aggressively to discredit its critics. The benefit level in the Food Stamp Program -- now called the Supplemental Nutrition Assistance Program (SNAP) -- is updated every year for food price inflation. The update occurs in October based on the Consumer Price Index in June. It is somewhat in the eye of the beholder whether to think of benefits as lagging by 4 months (counting from the start of the year) or 10 months (the average for the year) or being "15 months out of date by the end" of the year (with italics for emphasis). The lag in the benefit update does raise greater concern in the last couple years, because food price inflation has been higher recently. Here is a revised report on the topic by Dottie Rosenbaum at the Center on Budget and Policy Priorities. A somewhat offsetting consideration is that the Thrifty Food Plan has been increasing in recent years at a rate higher than the overall food price inflation measured in the Consumer Price Index (CPI). This has the effect of raising the food stamp benefit faster than the overall rate of food price inflation. Mark Lino at USDA's Center for Nutrition Policy and Promotion said the reason for this pattern in 2004-2005 (.pdf) was because the Thrifty Food Plan is weighted more heavily toward fruits and vegetables, milk, and lean meats, which experienced faster price increases. I imagine similar trends have continued more recently. An interesting article in the American Journal of Agricultural Economics this May used experimental data from an economics laboratory to address the following question: what would happen if legal concerns prevented commodity checkoff programs from using the federal government's power of taxation to collect mandatory payments from producers? It is generally assumed that advertising budgets for campaigns such as "Beef. It's What's for Dinner" and "Pork. The Other White Meat" would collapse if the producer payments were voluntary. The article by Kent Messer, Harry Kaiser, and William D. Schulze points out that certain clever types of auctions might enhance contributions even if they were voluntary. For example, under a plan called the "provision point mechanism" (PPM), producers would offer voluntary payments, but they would only really have to pay if the total voluntary payments exceeded a fairly high threshold. If the threshold is not reached, everybody gets their money back, and the advertising campaign never happens. This mechanism seems to generate higher contributions than traditional voluntary payment plans do. One might question the social importance and magnitude of under-provision of advertising for generic commodities. However, contrast the public health impacts from the types of foods associated with the majority of branded advertising, such as soda, beer, chips, and candy, to the types of foods that now benefit from mandatory generic advertising, such as fruits, vegetables, nuts, chicken, pork, beef, and milk. Not only do the generic commodities comprise the key nutritional elements of the United States Department of Agriculture food pyramid but these commodities also tend to be low in fat and salt (in comparison to branded snack foods and restaurant meals) and represent the bulk of what might be called the components of a healthy diet. If generic advertising for agricultural commodities collapses because mandatory programs are declared unconstitutional, the "Dancing Raisins" will be gone and the vast majority of ads for snacks will be for chips, cookies, and candy. Given important health problems such as obesity, juvenile diabetes, and osteoporosis, the under-funding of generic commodity advertising has serious public health consequences. Years of previous coverage here (and here) cast doubt on the claim that checkoff advertising is largely consistent with federal dietary guidance. The dancing raisins comparison is misleading, since a tiny fraction of checkoff advertising is for fruits and vegetables, while much of the funding is for high fat beef and pork and cheese. I don't think there even is a federal checkoff program for raisins. Raisins are not mentioned in Becker's CRS report (.pdf). Perhaps those ads were from a California state level board? If you believe that the checkoff programs are mostly about skim milk, not cheese, you've been hoodwinked by the public relations. I am not sure where the "low fat" comment came from -- federal dietary guidance gives greatest importance to saturated fat rather than total fat, and the products covered by checkoff programs are disproportionally high contributors to saturated fat in U.S. diets, compared to foods not covered by checkoff programs. And, how could lower checkoff advertising possibly lead to obesity? This is a very, very bad paragraph. I think the agricultural economics literature on checkoff programs would be stronger if it were less baldly apologetic on their behalf. A report (.pdf) by the Government Accountability Office (GAO) says that federal food label regulators are not keeping up with the growth in food products. * FDA does not have reliable data on the number of labels reviewed; the number of inspections, which include label reviews, has declined. For example, of the tens of thousands of foreign food firms in over 150 countries, just 96 were inspected by FDA in 11 countries in fiscal year 2007—down from 211 inspections in 26 countries in 2001. * FDA’s testing for the accuracy of nutrition information on labels in 2000 through 2006 was limited. 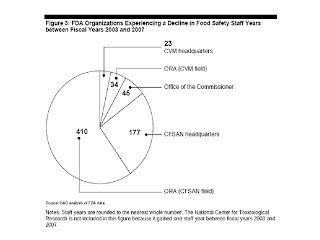 FDA could not provide data for 2007. 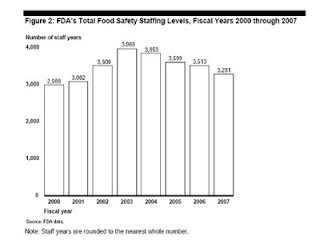 * Although the number of food firms in FDA’s jurisdiction has increased, the number of warning letters FDA issued to firms that cited food labeling violations has held fairly steady. * FDA does not track the complete and timely correction of labeling violations or analyze these and other labeling oversight data in routine reports to inform managers’ decisions, or ensure the complete and timely posting of information on its Web site to inform the public. GAO does offer up some solutions. See the recommendations. When food companies advertise, do they increase consumer demand for food categories, or do they just steal market share from other companies within a category? This question is important in U.S. food policy, because only demand expansion raises concerns about the impact of advertising on over-consumption and obesity. For many types of food and beverage advertising, I take these concerns about health impacts seriously. In the case of the new soup wars between Campbell and Progresso, however, it is safe to say that these advertisements are not going to expand consumer demand for the category! 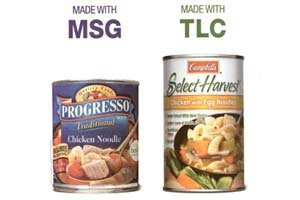 From Campbell, the accusation that Progresso soups use MSG. 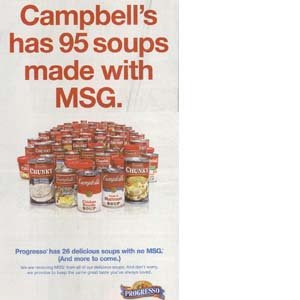 From Progresso, the accusation that Campbell soups use MSG. Marion Nestle covers this beat in two posts. BrandWeek also covers the two campaigns. It reminds me of those federally sponsored ads from the beef checkoff program a couple years ago, disparaging chicken (with a side swipe against carrots). Thanks to Asinus Asinum Fricat for compiling this list of products recalled due to melamine contamination. His full blog post, From China, With Love: Melamine, can be found on La Vida Locavore. I would suggest paying close attention to the growing list, as a lot of the products are candy, and Halloween is around the corner. Fricat points out, "Foods with low levels of dairy based ingredients, such as candies and biscuits, are likely to be infrequently consumed and in small amounts so they are not considered to be a high-risk food for potential dietary exposure to melamine even if the dairy ingredient has been adulterated." The Food and Drug Administration (FDA) this week updated its general FAQ page for melamine contamination. This is a global food list. FDA has only recalled Mr. Brown instant coffee and milk tea products. It is surprisingly difficult to design an objective way of measuring "food deserts" -- neighborhoods with inadequate food retail. I was thinking about this recently, because USDA's Economic Research Service is hosting a conference on the topic this week, which unfortunately I cannot attend. I read a lot of advocacy research on food deserts, but I also try to "ground truth" the formal research. A few months ago, I did a post on a walk through the South End and Roxbury in Boston. Below, I discuss a walk in June through Central Harlem with a friend who lives there. I have much longer experience living in mixed-income but high-poverty neighborhoods of downtown Washington, DC. A key challenge is defining retail conditions that characterize a food desert, but not a typical wealthy neighborhood. The walk through Central Harlem, for example, passed Citarella, an upscale small storefront market with fabulous produce. If one excludes such stores, then many wealthy neighborhoods would also be classified as food deserts, which is clearly not the intended meaning of the term. Does the presence of a Citarella make a low-income neighborhood adequate for fruit and vegetable retail? Many readers may say "no." Does the same store make a high-income neighborhood adequate? Many readers may say "yes." If these are the answers, has the classification become tautological -- having nothing to do with the retail, but really based on income alone? To make things more complicated, suppose one decides that low-income neighborhoods must have fresh fruits and vegetables in retail settings targeted to low-income consumers, in order not to be classified as a desert, but a Citarella is adequate for a wealthier neighborhood. In that case, what does one make of fruit stands like this one from the walk in Central Harlem? Is a neighborhood with fruit and vegetable stands no longer a desert? Do we assume that a brand-name corporate supermarket, typically oriented toward automobile traffic, is essential for adequate food retail in a densely populated low-income neighborhood? If we say neither the fruit stand nor the Citarella counts, then are we "fixing" the definition out of determination to classify this neighborhood as a desert? While we are on the topic of driving, what is our expectation for driving distances? If you plot supermarkets on Google Maps, richer suburban neighborhoods generally seem to have less retail access than low-income urban neighborhoods. Does that make the rich neighborhoods supermarket deserts? In the United States, even many low-income people travel to the grocery store by car. Clearly, a single neighborhood may have adequate retail from the perspective of some neighbors and not others. Do we assume that nobody in poor neighborhoods shops by car, while assuming that everybody in rich neighborhoods shops by car? The research on food deserts sometimes turns not on adequacy but on the ratio of "good" stuff like fruits and vegetables to "other" stuff like fast food restaurants or corner stores without fresh produce. For example, see this 2007 study of the same Harlem neighborhoods discussed above. Does the presence of liquor stores or fast food restaurants drown out the value of the fresh produce that exists in a neighborhood, such that the ratio is what matters? I have doubts. I don't ask these questions out of heartlessness. They are important because some of the implicit remedies, such as tax breaks to bring in supermarkets, have seriously expensive tradeoffs for poor neighborhoods that are already suffering from an inadequate commercial property tax base. I am just not sure that retail location decisions are the sort of decisions that governments make better than markets do. What do you think? How would you define a "desert" objectively, so that the definition is both reasonable and captures low-income neighborhoods you have in mind, without applying equally well to richer neighborhoods? 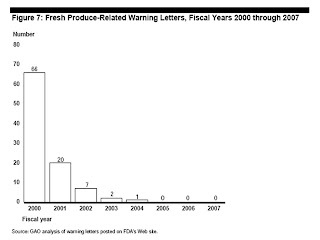 And here is the trend in FDA enforcement letters related to fresh produce, during precisely the years before and during major outbreaks of foodborne illness associated with produce. From researchers the Center for a Livable Future at Johns Hopkins, a new article (.pdf) in Public Health Nutrition argues that newspaper coverage of climate change commonly overlooks food sourcing as a contributing cause. In related news, the Take a Bite out of Climate Change blog, which focuses on this connection regularly, points out the online video at Fora.tv of the discussion of climate change and food issues at the Slow Food conference in August. The federal government is expected to appoint a new Dietary Guidelines Advisory Committee soon. The committee's appointment and first meeting were originally expected (.pdf) before the end of September. Every five years, the U.S. Department of Agriculture (USDA) and Department of Health and Human Services (HHS) collaborate on a revision of the Dietary Guidelines for Americans, based in part on a summary of the scientific evidence on nutrition and health prepared by an external advisory committee. The next edition is 2010. It is important that a high-caliber and impartial committee be appointed, because each sector of the food industry generally expresses intense interest in having the federal government endorse particular messages -- or refrain from particular messages -- that affect commercial interests. My first suggestion would be to simplify. The 2005 Dietary Guidelines were more complex than earlier editions, focusing more on nutrients than widely recognized foods. The 2010 edition could make recommendations in plain English about real foods. Alongside any recommendation about a nutrient, the Guidelines should immediately explain the leading food sources of that nutrient. For example, saturated fat comes predominantly from meat, butter, and cheese, and to a lesser extent from vegetable oils. My second suggestion would be to explain more specifically what messages are inconsistent with the Dietary Guidelines. For example, at a cost of several hundred million dollars per year collected from producers under federal authority, the federal government endorses industry-run checkoff advertising programs that encourage increased consumption of meat, butter, and cheese. The Guidelines should be sufficiently clear so that an independent observer could tell which advertising campaigns are consistent with the Guidelines. My third suggestion is that the Guidelines specifically address the most common misleading nutrition messages used in advertising and marketing. For example, they should plainly comment on fad weight loss diets and misleading claims for particular micronutrients. My fourth suggestion is that the Guidelines strongly endorse home cooking. Many chain restaurants have been reluctant to provide clear nutrition information at the point of sale, except when forced to do so. Even when nutrition facts are provided, I think we all eat high-calorie and unhealthy foods in restaurants that we would never have cooked for ourselves or prepared for a loved one at home. You will have an opportunity for input on the 2010 Dietary Guidelines this Fall, but why not get the conversation started now? What are your suggestions for the revised Guidelines? What are your criteria for the independence and qualifications of the advisory committee?